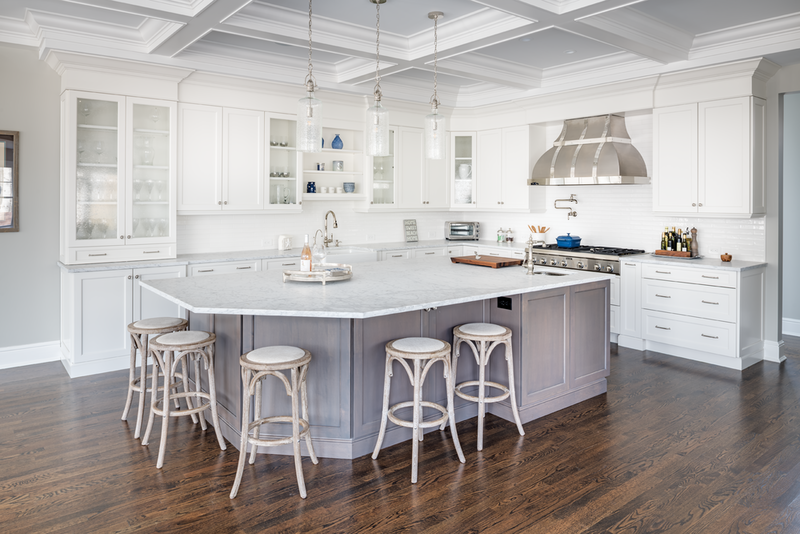 Michael Mangino from Artista Kitchens and Charles Nostrand of Exquisite Interiors collaborated to create this gourmet kitchen and entertainment space that fulfilled the dreams of these homeowners, including the household chef. Brookhaven by Wood-Mode cabinetry is the anchor of this kitchen. The modified shaker door style, Edgemont Recessed in Nordic White on Maple, surrounds the space and is accented by the maple island stained in Matte Storm Cloud. This space is perfect for cooking, entertaining and relaxing, which is exactly what these homeowners needed to balance their hectic lifestyle. The open shelves and glass cabinetry add a subtle touch of elegance with a casual feel. Professional appliances, paneled refrigeration and dishwashers (perimeter and island) and a custom hood enhance the function and beauty of this expertly designed space. With seating for five on the island and a large kitchen table, there is ample space for everyone to relax and enjoy each other’s company and the chef’s creations. The farm sink on the perimeter and the prep sink on the island create an easy flow from appetizers to dessert and give the homeowners the ability to cook, dine and mingle at every gathering. This kitchen is cozy enough for a small dinner party or can host a large gathering of friends and family. These East End homeowners fully participated in the remodeling process and together with Artista and Exquisite Interiors, their retreat is everything they envisioned and more.